Nobody has ever recovered from paralysis. Until now. Patients using epidural stimulation therapy have regained abilities once believed permanently lost when the spinal cord is injured. BEL13VE is funding the medical research at the Mayo Clinic required to make recovery possible for everyone living with paralysis. Please join us. Together, we will get this done. Three people whose legs have been paralyzed for years can now stand and take steps again. Each patient received an implanted device that provides an electrical stimulus to the injured spinal cord and underwent months of intense rehab. These results were reported by two teams of scientists working separately. The procedure is not a cure. When the spinal stimulator is switched off,they can no longer voluntarily move their legs. But during one physical therapy session at Mayo Clinic, 29-year-old Jered Chinnock moved back and forth enough to cover about the length of a football field. Severe spinal cord injuries leave the brain’s “get moving” instructions unable to reach the nerves that activate muscles. Previous researchhas tried other technologies, such as encasing patients in robotic-like exoskeletons or implanting muscle stimulators, to help move paralyzed limbs. With this new approach, referred to as epidural stimulation, the three patients are taking steps under their own power — intentionally moving, according to the reports published Monday by Nature Medicine and the New England Journal of Medicine. Lee and Kristin Zhao, who directs Mayo’s assistive and restorative laboratory, lead the research team that became the first in the world to successfully replicate and validate recovery results achieved using epidural stimulation. Chinnock is the first patient in that Mayo study, and his success surprised them. Jered was paralyzed in a 2013 snowmobile accident, with no movement or sensation below his mid-back. He underwent 43 weeks of intense physical therapy and stimulator adjustments. At first, trainers positioned his knees and hips to help him stand, swing his legs and shift his weight on a treadmill. Four years ago, in April 2014, Harkema’s team made headlines when a four patients implanted with spinal stimulators — originally developed to treat pain — were able to wiggle their toes, move their legs and briefly stand. But they didn’t walk. 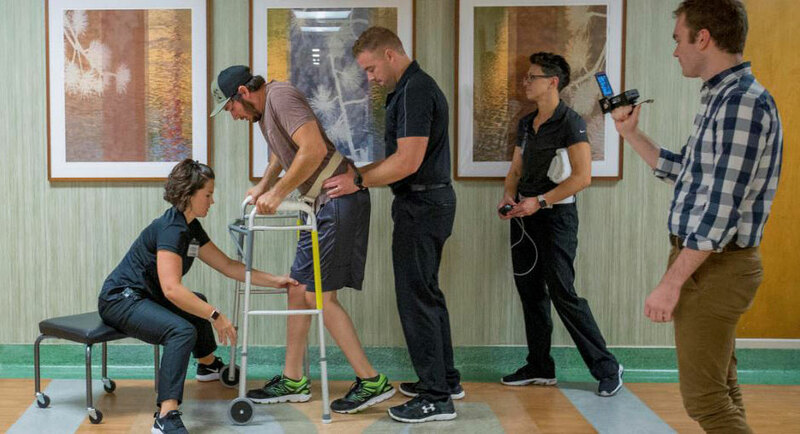 Harkema’s team continued working with epidural stimulation, and of four new paralyzed volunteers eager to test the approach, two eventually walked with assistance. In one training session in the lab, Jeff Marquis, 35, of Louisville made it almost the length of a football field without stopping for a rest. It’s not clear why the other two Louisville, Kentucky participants weren’t able to take independent steps. But that report illustrates an important caution about safety: One fractured a hip during a rehab treadmill exercise even while carefully supported and upright. A Start. Much More Work Required. The approach will need larger and longer studies not just to see if it can help other patients but to delineate risks. It’s also not known how much such care would cost, as researchers work to improve the stimulators. The work is part of a quest to help people with spinal cord injuries regain function, and specialists say while it’s only been attempted in a few people, it’s a promising approach that needs more study. For the first time, research has found a way for people living with chronic paralysis to regain what was lost. Until now, therapy has been limited to helping people live with what was lost. Using a grant from the BEL13VE Foundation and other funding, in April 2017 Mayo Clinic became the first medical center in the world to replicate and validate paralysis recovery results achieved using epidural stimulation. Jered is the fifth patient with results published in medical journals to use epidural stimulation therapy to regain abilities once believed to be permanently lost. According to the Mayo team, Jered’s results exceed anything achieved so far. Starting in 2011 at the University of Louisville, Dr. Susan Harkema performed the first four successful epidural stimulation procedures on human patients with chronic paralysis. Rob Summers (at right in the picture above) was the first to undergo the procedure. Three years prior to replication study completed by Mayo Clinic, in April of 2014, Dr. Susan Harkema was featured on the Today Show and in numerous other national and regional news stories to talk about the stunning findings from her research on spinal cord injury recovery using epidural electrical stimulation. Mayo Clinic became the first medical center in the world to replicate and validate paralysis recovery results achieved using epidural stimulation. Reports on a case of chronic traumatic paraplegia in which epidural electrical stimulation (EES) of the lumbosacral spinal cord enabled (1) volitional control of task-specific muscle activity, (2) volitional control of rhythmic muscle activity to produce steplike movements while side-lying, (3) independent standing, and (4) while in a vertical position with body weight partially supported, voluntary control of steplike movements and rhythmic muscle activity. This is the first time that the application of EES enabled all of these tasks in the same patient within the first 2 weeks (8 stimulation sessions total) of EES therapy. A study published in the medical journal BRAIN found that four young men classified with a chronic motor complete spinal cord injury (just like Jack) were not only able to voluntarily move their legs in the presence of epidural electrical stimulation, but also regained voluntary movement in their hips, knees, ankles and toes. Even more amazing, and unexpected, these first four research participants have also shown a myriad of improvements in their overall health, including increased muscle mass, improved regulation of their blood pressure, reduced fatigue, and they were able to bear weight independently…stand! They also each regained bowel, bladder and sexual function. “The circuitry in the spinal cord is remarkably resilient. Once you get them up and active, many physiological systems that are intricately connected and were dormant come back into play,” said V. Reggie Edgerton, Ph.D., UCLA distinguished professor of integrative biology, physiology, neurobiology and neurosurgery and a contributor to this new research work. These research results are truly amazing and inspire our foundation to keep pushing to bring a sense of urgency, awareness, and funding to spinal cord injury recovery.